Noise hypersensitivity or hyperacusis is when sounds are painfully uncomfortable for the patient. Hyperacusis may be a symptom of a medical condition like migraine headaches, a structural anomaly like superior semicircular canal dehiscence or perilymphatic fistula, or recruitment phenomenon due to nerve hearing loss, but sometimes there is no obvious reason for it. It just is and there's no obvious etiology nor medical treatment for it. Such patients become socially withdrawn because normal sounds are just too painful. However in 2014, researchers at the Ear Research Foundation (Sarasota, FL) described a minimally invasive way to surgically correct hyperacusis by plugging up the cochlear round and oval windows [link]. This promising technique to treat hyperacusis was further confirmed with a larger sample of patients in 2016 [link]. For the purposes of semi-objective testing, hyperacusis is defined as significant discomfort when a presented sound is below 90 dBHL, something that can be easily assessed by an audiologist. This measure is known as ULL (Uncomfortably Loud Level). Click here for a noise chart describing different sounds and their loudness level. The surgery itself is performed through the ear canal after obtaining graft material off from the tragal cartilage. 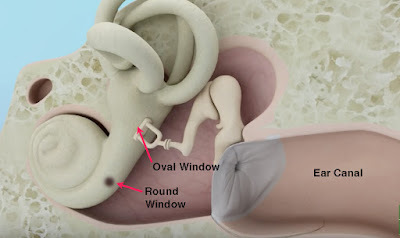 The eardrum is lifted away and the tragal graft material is plugged into the round window as well as between the crura of the stapes to plug the oval window (like putting a cork in a bottle). Keep in mind this is a relatively new procedure with less than a dozen patients who have so far undergone this procedure, but is an option that may provide some hope for patients who suffer from hyperacusis resistant to treatment. Round and oval window reinforcement for the treatment of hyperacusis. Am J Otolaryngol. 2015 Mar-Apr;36(2):158-62. doi: 10.1016/j.amjoto.2014.10.014. Epub 2014 Oct 14. I wonder if this procedure will cause any hearing loss. I can visualize that this minimally invasive way of surgery would be definitely working like magic for millions of people. GREAT JOB!